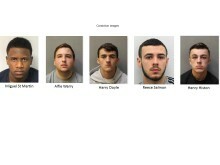 Four moped enabled bandits who snatched mobile phone, committed robberies in Camden, Islington and Westminster and targeted luxury shops for aggravated burglaries have been convicted today, Friday, 15 February at Blackfriars Crown Court. Those who pleaded guilty or were found guilty today targeted Boodles jewellery store and Saint Laurent, in the west end of London, last year. [D] Reece Salmon, 20, (06.05.98) of City Road, Islington pleaded guilty to conspiracy to commit robbery (Camden, Islington, Westminster, and the City). He was found not guilty for conspiracy to commit robbery at Boodles jewellery store. [F] A 17-year-old boy who pleaded guilty for conspiracy to commit aggravated burglary, namely 17 linked offences at three mobile phone stores across north and east London in 2016, and conspiracy to commit robbery (Camden, Islington, Westminster, and the City). [H] A 16-year-old boy pleaded guilty to conspiracy to commit robbery (Camden, Islington, Westminster, and the City), and conspiracy to commit robbery at Boodles jewellery store (He was sentenced in May 2018 at Highbury Youth Court after he pleaded guilty to conspiracy to commit robbery at Boodles jewellery store. He received a two-year sentence in a young offenders' institute). All defendants will be sentenced together at the same court, on a date to be confirmed. 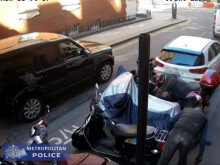 Operation Vocare was initially set up to target an Islington-based moped gang who robbed three mobile phone outlets between May and November 2016. As a result, 13 members of the gang and three handlers were convicted during trials that took place between August 2017 and October 2018. 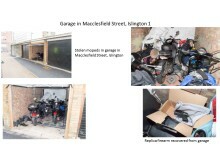 In February 2018, Vocare officers' attention was again drawn to the gang after they discovered that a garage in Macclesfield Street in Islington was being used by other gang members who were snatching mobile phones from members of the public in Camden, Islington, Westminster, and the City between August 2017 and February 2018. A search of the garage recovered stolen phones, SIM cards from stolen phones, the handle from a broken zombie knife and a replica firearm. Recovered mobile phone footage showed these suspects stealing a moped in broad daylight and threatening a security guard with a large zombie knife. During the compiling of evidence, on 26 March 2018, at 11:00hrs St Martin, Harry Doyle, 18, Henry Histon, 18, a 16-year-old boy [H] and two other as yet unidentified people attempted to rob Boodles jewellery store on Sloane Street SW1. Armed with weapons including axes - samurai swords - three of the suspects travelled there in a stolen Land Rover Discovery, and three were on unregistered mopeds which they had parked in a nearby back street the night before. They tried to ram the rear doors of the building with the Land Rover, but were unsuccessful. They then attempted to smash the doors with sledgehammers - again unsuccessfully. A 48-year-old man interceded and grabbed defendant [H] but was set upon by the rest of the gang. He received a stab wound to his back and another to his knee, inflicted by one of the axes. The wounds were non-life threatening and the victim made a full-recovery. 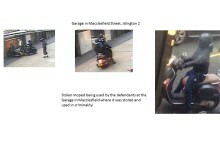 The gang then fled the scene on the mopeds, leaving behind the Land Rover. [H] was arrested later that day by Flying Squad officers after he was found hiding in a nearby school. They also recovered the mopeds used in the robbery as well as clothing, weapons and a phone used in the offence, which were submitted for forensic analysis. On the same day, Op Vocare officers tracked St Martin to a hotel in Kings Cross. He was arrested on suspicion conspiracy to commit robbery (Camden, Islington, Westminster, and the City). In his room a 'zombie' Knife, four stolen mobile phones, and two Saint Laurent handbags (collectively worth £10,000) were seized. The discovery of the handbags led officers to investigate the Saint Laurent burglary. Store CCTV identified clothing worn by the suspects during the burglary - some of which were found in St Martin's hotel room. CCTV from the hotel, identified further suspects in the offence - namely Warry and Histon. The fourth person is still to be identified. St Martin was then arrested for the Saint Laurent burglary. 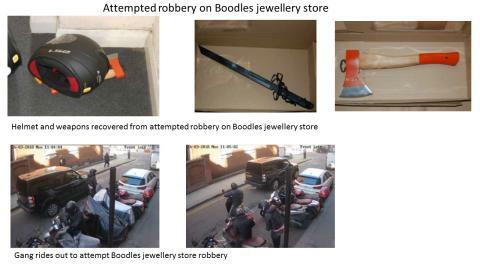 Information from mobile phones in his possession tied him to the attempted robbery of Boodles jewellery store. On 20 June 2018, officers from Operation Vocare and the Flying Squad, arrested the outstanding suspects, defendants B - H.
Detective Sergeant Danny Watts of Operation Vocare, said: "These gang members were big operators in north and central London. However, we secured a number of significant convictions and sentences against them and they have been taken off the streets. "We are committed to taking every opportunity to divert, disrupt, detect and prosecute those involved in these moped related crimes." 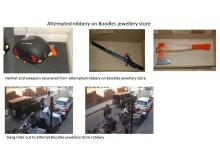 Detective Constable Phelim Redmond, Flying Squad and officer-in-charge for the Boodles jewellery store armed robbery, said: "This was a brazen attempt to rob Boodles jewellery store and a cowardly, vicious attack on an unarmed member of the public who bravely intervened. It is by sheer good fortune that having been set upon by four men wielding axes and swords that he did not sustain more serious injuries. "This has been a complex investigation, and I hope the people of London are reassured that five of those involved in this robbery are now behind bars."